Kelsey Thomson, a 2006 member of the Cadets' color guard, sent this picture. This is a picture of the "Flanagans" of the 2006 Cadets' color guard at the corps' awards banquet in December, 2006. We all went to high school together and marched with Flanagan World Guard (WGI seventh place 2005, fifth place 2006). Jade and Caroline were my captains in 2005 and I went on to be captain in 2006. I wouldn't have had the courage to march this summer without these amazing girls with me! Thanks! 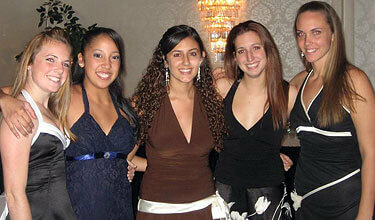 Left to right: Rosemary Schwartz (Flanagan High 02-05, Boston Crusaders 05), Caroline Monge (Flanagan High 02-05), Marissa Mendez (Flanagan High 02-05), Jade Bouza (Flanagan High 02-05), and Kelsey Thomson (Hollywood Hills High 03-04, Flanagan High 05-06).